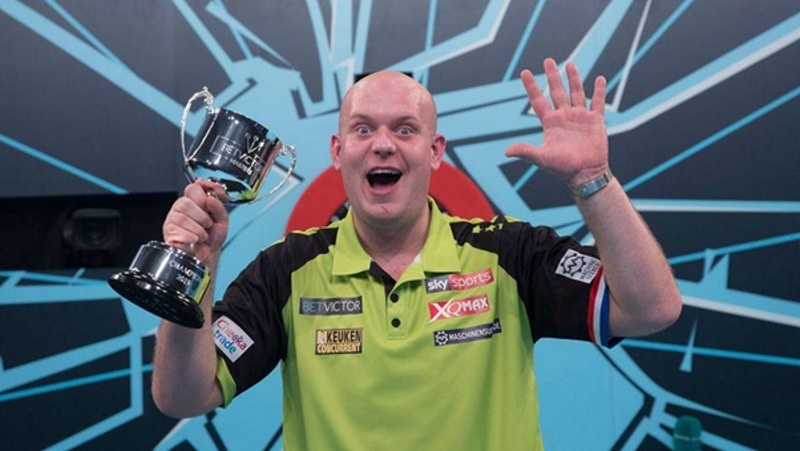 Michael van Gerwen’s 2019 PDC darts season got off to a brilliant start last weekend after he beat James Wade 11-5 to the Masters final for the fifth year in a row. Worryingly for his competitors, the newly crowned world champion was in viciously good form hitting two 170 checkouts on last day of the event, one against Dave Chisnall in his 11-7 win in the semi-finals and the other against Wade in the final. Mighty Mike also averaged just shy of 100 compared to Wade’s 87 and landed three ton plus+ finishes, but weirdly only the two 180s. The Dutchman got off to a flying start thanks to an opening 13-darter in leg one before slipping slightly in the second after misfiring on five doubles that would have given him a break of throw. Instead, The Machine duly saved the leg. MVG took back control in the third, however, when he closed out the leg with a brilliant 124 checkout on the bullseye. Wade, who saw off the threat of Peter Wright in the semi-finals earlier in the evening, soon drew level, finishing from 76. This was before van Gerwen hit a 14-darter to retake the lead, after which he never looked back. Hitting a 13-darter in the next leg before landing another bullseye finish in the following leg, the Dutchman started to turn the screws before banking his second 170 checkout of the night. Wade did manage to take the following leg but the damage was already done as 29-year-old MVG took the next two to get his hands on the trophy yet again. Nine of world’s best darters will begin their 17-week quest for the Darts Premier League title in Newcastle this Thursday as they aim to celebrate at London’s O2 Arena come May 23rd. Following the news that Gary Anderson will not be taking part in this year’s tournament, the PDC took the radical decision to replace the Flying Scotsman with one guest player a week for the next nine weeks. Those nine players called up to take part in the weekly guest role are Chris Dobey, Steve Lennon, Luke Humphries, John Henderson, Nathan Aspinall, Max Hopp, Dimitri van den Bergh, Jeffrey de Zwaan plus recent PDC recruit and current BDO World Champion Glen Durrant, who only received his PDC card last month. Points won by guest players will not count towards the league table but their opponents will retain any points gained from the matches. After Judgement Night on March 28 in Rotterdam, one player will drop out and no more guests will be featured thereafter. This will leave eight players to battle it out over the remaining seven league fixtures in Liverpool, Cardiff, Birmingham, Manchester, Sheffield and Leeds before the showdown in the capital. Anderson had been the clear second favourite for the title, but his withdrawal will now make van Gerwen’s position as the favourite even shorter than it already was. Betway make him 8/15 to add the Premier League, which he won in 2018, to his World title. You can also get 7/4 for a new winner to take the crown. One such player would be last year’s runner up Michael Smith who is second in the betting at 7/1. There is an interesting case to be made for Mensur Suljovic too who, at 16/1, represents fine value. The Gentle had a terrible debut season in the Premier League last year winning just twice in nine matches, which led to his elimination on Judgement Night, but he also averaged a decent 99 throughout the tournament which was only bettered by MVG and Gary Anderson. His checkout success was also strong, with only Mighty Mike and Rob Cross faring better. The Premier League experience he picked up last year and the freshness acquired from an absense in the ProTour and European Tour events might just propel him on for a more successful campaign this time around. At the other end of the table, Raymond van Barneveld and Gerwyn Price are the two favourites to bid an early farewell in the tournament. The final season for former great Barney has the potential to be a disappointing one, as indeed it was last year. But the popular Dutchman will feel the goodwill of the fans as he plays his last Premier League campaign and while he is 40/1 to win the title, he is also 9/4 to finish bottom, which sadly for Barney, looks more likely. As for matchday one, get on James Wade to inflict Barney’s first defeat of the campaign, Daryl Gurney to start with a win over Gerwyn Price, Mensur Suljovic to beat our first guest opponent Chris Dobey, MVG to win in his heavyweight clash with Michael ‘Bully Boy’ Smith and Peter Wright to punish Rob Cross in the last match of the night. An accumulator on Wade, Gurney, Suljovic, van Gerwen and Wright will pay 28/1 at Betway.